Photo courtesy of Graham County Historical Society. 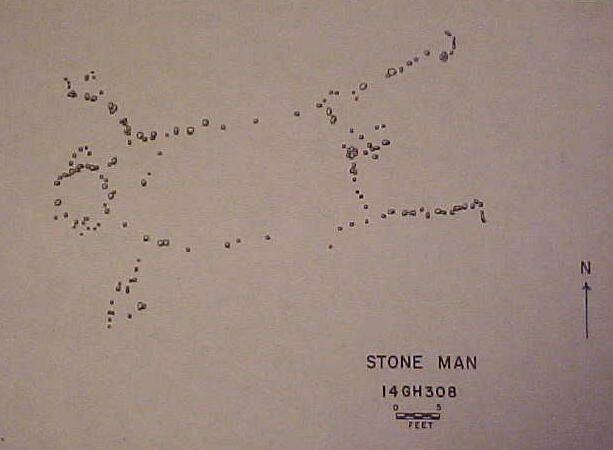 The Penokee Stone Man is an unusual figure of rocks, around 100 in all. He is 57' head to foot and 32' between each outstretched hand and made mostly of limestone. The limestone is mostly buried and the grass covers much of it so it's best to take in from the air. No one quite knows how the Stone Man got to be where and what he is today but there are a few theories. A religious site for nomadic Indians is one theory. The other is it being a symbol of fertility. Researchers' best guess for the stone placement is the nomads but they still wonder why they would have taken the time to construct the Stone Man when they weren't planning on staying. The Stone Man being a symbol of fertility theory come notations of his genitalia being "big enough for two elephants." It has also been discussed that, since the Stone Man's head lies to the east, the heavens were important considerations in the construction. The Penokee Stone Man is viewed the best from the air. It is on private property and the owners don't let just anybody up there to see him, being so fragile and all now. It is asked to please respect this consideration. More information can also be found at the Graham County Historical Society and the Graham County Public Library, both in Hill City.